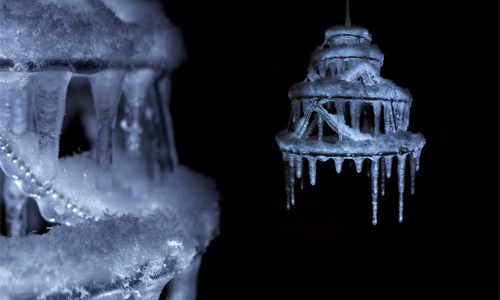 An ice chandelier, result of human conception and nature’s intervention. Designed to be hung from a branch of a tree in winters, it is composed of a metal structure covered with a soft white woven fishnet that catches water in all its forms. At dawn, when the morning dew deposits micro droplets on the surface it gradually freezes and turn into stalactites. Over course of the day, the structure stiffens coated with ice. At nightfall, it glows as rays pass through the ice, thus highlighting the beauty and delicacy of crystallization of water. This ephemeral work of nature exudes a timeless boreal light. 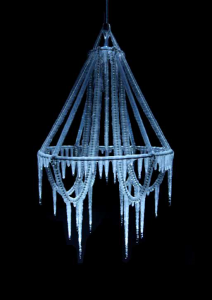 This faraway, atmospheric light reinterprets a crystal baroque chandelier. It sees water, frost and ice as functional materials, and enhances each of their aesthetic, ecological and structural qualities. This project considers factors of climate as potential drivers that can interact with manmade objects. It is the first result of my ongoing experimental research on relationship between manufactured objects and the four elements of nature.